It's been an interesting week. In the UK new Labour leader Jeremy Corbyn crowdsourced his questions for Prime Minister's Question Time. In the US a 14-year-old boy was arrested for making a digital clock, and then invited to the White House by President Obama. And in Cupertino, a bug so devastating it can't be allowed to escape means the watchOS 2 update didn't happen as planned. 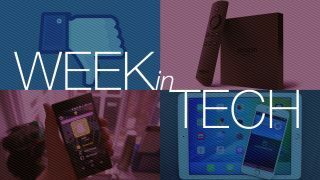 It's an OS-updating, Fido-feeding, Ford-finding Week in Tech! Fancy a better battery, a faster phone and sleeker, more beautiful hair? iOS 9 can help with at least two of these things. The update is out now and as Matt Swider says in his in-depth iOS 9 review, it's much better than its predecessor. Only Apple Maps prevents it from being "the perfect update": it's got better Siri, a better keyboard, iPad multitasking and it's compatible with devices going back to the iPhone 4S. Once you've got it, check out our 50 killer tips for iOS 9. There are lots of new goodies for you to try. There's a new version of the Apple Watch OS too – watchOS 2 – but sadly you can't download that just yet: its release has been pulled at the last minute due to an enormous but unspecified bug. Are you wearing the future of Fords on your wrist? If you've got an Apple Watch or Android Wear device and a Ford electric or plug-in hybrid, you might be. Ford has updated its MyFord Mobile app for both iOS and Android to bring a whole range of features to your wrist. You can manage the climate control, lock and unlock the car, check its charge status, and even get directions to where you've parked. For now it's limited to the C-Max Energi, Focus Electric and Fusion Energi, but Ford's keen to bring it to more vehicles in the not too distant future. Uber, the infamous ride-sharing firm that's not entirely popular among taxi drivers, has a bright idea: self-driving cars doing absolutely everything. Our in-depth look at the technology behind the startup is fascinating enough, but what's really interesting about Uber is the ambition it's bringing to that technology: its goal is "to provide transportation for everyone and everything everywhere" – not just people, but groceries and packages too. It thinks driverless cars will be key to that, and while it's not saying when it expects to transition to self-driving vehicles, it's clear that for Uber it's a case of when, not if. The article's fascinating and a little bit frightening too. Bad news! Project Morpheus is no more! Good news! It's been renamed, not killed! The VR system known as Project Morpheus is now the much duller-sounding PlayStation VR. Thrilling it ain't, but it's probably easier to sell. Sony announced the change at this year's Tokyo Game Show alongside a Bloodborne expansion, Everybody's Golf for the PS4 and another Assassin's Creed: Syndicate trailer. We've rounded up the most interesting TGS announcements right here. Bad news for Snapchat replay fans: replays on Android now cost real cash money if you want to see more than one per day. James Peckham says that's a sign that Snapchat has no idea how to grow: "Flailing its arms in the air, the company has now decided to charge users for one of the apps most limited features," he says. "Even sticking in a quick advert for a film inside my Snapchat window would be better than charging ridiculous money for a feature that should come free." Facebook: would you like a dislike? Facebook is working on a dislike button that means you'll be able to share sadness as well as happiness. As Cameron Faulkner says, "Basically, Facebook doesn't want you to troll people with the new dislike button, but to rather use it to 'express empathy,' as Zuckerberg stated. I feel like I know how this will pan out already." The button hasn't even been launched yet but Matt Swider is already hammering it. "Facebook is playing right into the hands of this snarkiest generation in history, motivating 20 and 30-year-old millennials to downvote posts without ever reading beyond the headline… it spurs a new form of laziness. It's a shallow way to show feeling without ever expressing true empathy." Amazon Echo says: feed fido! In Silicon Valley's ongoing quest to automate everything its parents used to do, Amazon has given petcare firm Petnet a big pile of cash to create products that integrate with Amazon's Echo home hub to feed pets. Petnet's first device is the SmartFeeder, which uses an app to track feeding frequency and how much food is left inside and remind the owner to feed Fido. To think, in the olden days people had to check bowls and remember to put dog food in them. The horror! Amazon also announced a brand new Fire TV box - one that supports 4K streaming. The new box will be rolling out on October 5 and brings a faster processor and improved controller with it. There's also a new Fire TV Stick, but this one is just getting voice commands and won't be getting the same resolution upgrade. Finally, the company announced a new 7-inch Fire tablet that costs an incredibly low £50/$50. However, to subsidise the price, Amazon will give you adverts on the lock screen - unless you pay a little more to get the tablet without them.